Pradip Kumar Banerji is an Independent & Non-Executive Director of Vikas Ecotech Limited. He was the member of the Indian Administrative Service (1966 batch), West Bengal. A noted public servant, he has served in several senior level government positions. 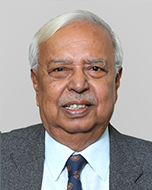 He served as the Finance Secretary in the Government of India and Secretary to the Governor of West Bengal. He was awarded the Padma Shri in 1972 for an outstanding contribution to public service. He holds a post graduate degree in Economics from Lucknow University. Copyright . Vikas Ecotech Ltd. All Rights Reserved.